Possible Opening Ceremonies for the 2016 Olympics in Chicago? Maybe the teachers were having the schoolchildren practice just in case President Obama had the winning bid to have the 2016 Olympics in Chicago? I just wish this video would have had the "Mmm Mmm Mmm" song, it's waaay more catchy. Question to Hugo Chavez: "Can you explain your relationship with President of Iran?" Answer from Hugo Chavez: "...the people from Fox News are stupid. Not you, of course." Hugo Chavez's wife: Where have you been? Hugo Chavez: I never liked your mother. When she sings an angel dies. But, not you, of course. The true test of a politician? The ability to not give an answer. I remember the mainstream media being outraged when President Bush was being compared to Hitler. Oh, wait... what? That's right, media outrage didn't happen when *that* President was being bashed. Wow... where to begin? President Obama made sure to say, "For those who question the character and cause of my nation, I ask you to look at the concrete actions we have taken in just nine months. On my first day in office, I prohibited without expectation or equivocation the use of torture by the United States of America. " Personally, I think it would have been more amusing if he would have said, "On my first day of office, I prohibited without expectation or equivocation the use of caterpillars by the United States of America." Our version of torture is laughable in comparison to the torture methods used in other countries. Rest assured though, President Obama has protected those who wish death upon us from those vicious caterpillars. President Obama also said, "America intends to keep our end of the bargain. We will pursue a new agreement with Russia to substantially reduce our strategic warheads and launchers." Hooray!! We are going to lead the world into getting rid of nukes and we'll do it with lollipops!?!? Maybe they didn't get the TPS Report that the world won't even follow our lead with Al Gore's Global Warming restrictions, especially India. What makes President Obama think the world will follow our lead with nuclear weapons? 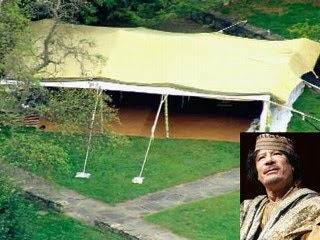 Then... the gem of comedy gold... de facto leader of Libya, Muammar Gaddafi. After hearing his incoherent rant, that lasted 90 minutes, it made perfect sense to read that he comes with a traveling tent. What freak show doesn't? I think we can all have a teachable moment from this, maybe the U.N. should have music play people off like the Academy Awards? Or maybe a "wrap it up" blinking sign? Labels: Al Gore, Caterpillars, Global Warming, Libya, President Obama, Russia, U.N.
You can find more of Steven Crowder's conservative antics on YouTube and Twitter. Also, Zo's very macho Macho Sauce Productions can be found on YouTube and Twitter. Perfect way to start the day!! This scene in the movie Tombstone best explains the relationship between ACORN and the Mainstream Media. 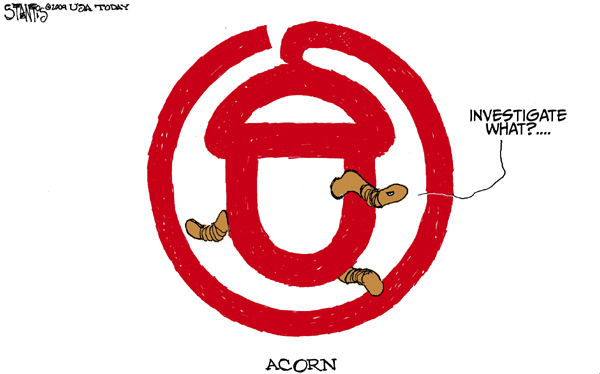 Many wonder why on earth the MSM isn't covering the ACORN story? The MSM is portrayed by Wyatt Earp (Kurt Russell) and ACORN is played by Ike Clanton and Curly Bill. To be "fair" to the Mainstream Media, this is the beginning of the movie. Later, Wyatt Earp grows a spine and does his job. Let's hope the Mainstream Media does the same. Also, maybe the most embarrassing is Charles Gibson. I found his comments on the ACORN scandal to be repulsive. His fake laugh and claiming he "doesn't know anything." Yeah... sure buddy... maybe pokers just not your game? If Joe Wilson was going to interrupt, he should have gone full force "liar" a la Princess Bride. On September 11, 2001, at age 32, Lance Richard Tumulty was one of the victims lost in the terrorist attack on the World Trade Center. Lance was a tender, loving husband, doting father and friend to many. He left behind his wife, Cynthia, and his two little girls, Sara and Caroline. Lynne Devlin wrote about Lance, "Lance loved life more than most people I know. He lived life to the absolute fullest, doing everything from hunting, to motorcross, fishing and skiing. I think Shawn said it best at the funeral though, it was more than that - Lance got into your soul. His enthusiasm was more than I've ever encountered." Kate Hamm wrote, "I always knew when Lance was around because the first words out of his mouth were 'Hey Baby!'" Susan Barricella wrote, "...Lance was a fun and outgoing person, who made everyone around him feel at ease." Lin Miller said, "Lance had the biggest heart of anyone I knew. He had a tough exterior, but when you needed anything, you didn't even have to call. He would help." He was deeply in love with his wife Cynthia. Lynne Devlin wrote, "I used to love the way Lance looked at you, like no one else in the world existed." 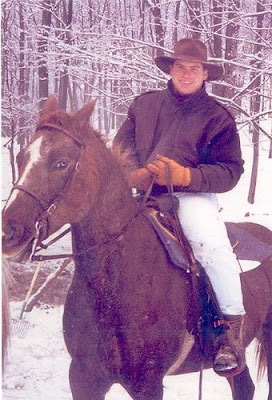 Lance's mother-in-law said, "He was a great dad, a great, great dad." From the moment they came from the hospital, Lance adored and cared for his children. Jim Michaels wrote, "We remember the love we saw in Lance's eyes for you and your daughters, but most of all we remember Lance's humor and his ever present smile." Lance's daughter Sara was talking about her father and said, "I was hoping the angels would have brought him back to me, but the angels brought him straight up to heaven instead." My name is Kristy Brennan (then Rodgers) and I knew your Dad when he drove a black Mustang and played football when he was in college! I can't believe 3 years have gone by and I am just finding this out tonight. I don't know how I didn't know sooner. There is sooo much I want to say - so many of the things are so true...Lance had a way of getting into your heart right away - he would have done anything for anyone ... at anytime - at any point. See - if it wasn't for Lance I would have never graduated from College. At that point - my Mom was dying from Cancer and Lance would drive me back and forth from Glassboro to Perth Amboy & back again for our games.....If it wasn't for Lance - I would have never graduated (I hated Stats - Economics & Finance) - Lances favorites!! See - I have so many "not important" memories but things that have changed my life forever - Thanks to Lance & I wanted you to know. MY mom too is in heaven & I am sure she met Lance at the gates - she loved how big he was & she loved his hugs more than anything. Cynthia - I remember I spoke to Lance once after you were married (he LOVED you more than anything !) when he called me to see if I wanted a job working with him....we lost touch somehow after that - not sure how ... but we did! I just wanted you to know how much Lance meant to sooo many people & like you I have a daughter - Emmy is only 6 - and I am sure the girls have his smile! In The Bedford Anthology of World Literature: The Ancient, Medieval, and Early Modern World, Beginnings -1650 that "...many anthropologists believe that women were central figures in this life... women were the childbearers, the nurturers, and the principal tenders of crops." Women were the central figures because they were honored for their fertility. When did having babies become a burden? Or as President Obama said about his girls, "If they make a mistake I don't want them punished with a baby." How does this "progressive" stance of ending the life of a baby help/benefit women? The truth is abortion doesn't help or benefit women. Abortion doesn't solve the "problem" it just creates new health and mental problems for women to deal with. The true feminists are the ones who cherish what women were blessed with, the miracle of giving life. One of my favorite movie scenes... ever. Mayhaps Tim Hawkins is a new Man Pants addition? Welcome aboard, sir, welcome aboard.